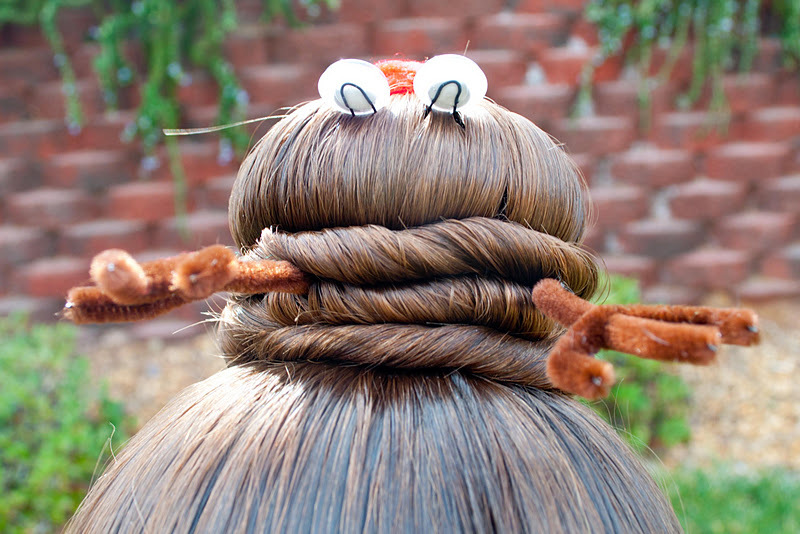 We are starting a new segment called "Holiday Hairstyles" that we will be doing though the month of December. We have some fun ideas for you so keep checking back! This on is our Rudolph style and it's very simple. These are ideas for supplies that you can use. 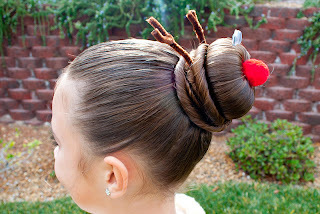 You may substitute the bun mold for a rolled sock and the reindeer hair clips are optional as well. The nose and the eyes are just glued to hairpins. 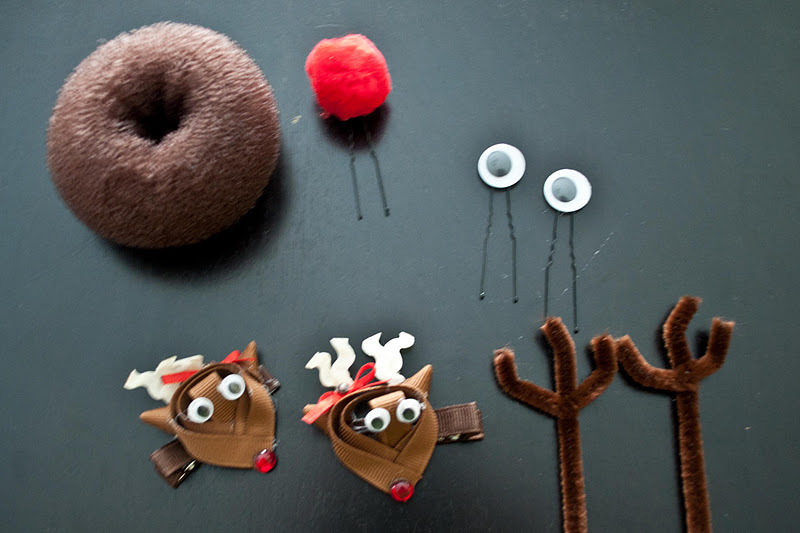 The antlers are just brown pipe cleaners and you don't have to attach them to anything. 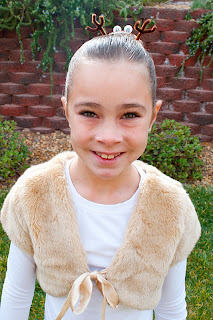 Pull the bun mold or sock over your ponytail and then spread the hair evenly over the mold. Grab a second elastic and secure it over the top of the hair and the mold. Take any hair that is remaining and breaking it up into sections that you will twist. Wrap those twists around the base of your mold and secure them in using bobby pins. Now grab your nose and eyes and place them where you like. I find that the nose looks best right in the middle of the bun. Finally you will go ahead and stick your antlers in on the top. We poked our into the twists at the base of the bun but you can also put them right into the mold if you like! I sported this today and it was such a hit! I can't tell what the red nose is made of! Can someone tell me? It's one of those pom pom balls that you can find in the craft section. Probably in kid crafts. I just saw someone pinned this on Pinterest and I traced all the pins back to you. I love this! If I were still a server I would where this hairstyle for the season. Kids and their parents would get such a kick out of it! I saw this picture somewhere a while ago and decided this weekend to to a youtube video tut on it. I didn't remember where I saw it but i did mention that it wasn't my original idea. While surfing the web today, I found you. That's awesome because now I can give you credit for this idea. I'm going to add your post to mine now!! I did this to my daughters hair today. She LOVED it. I am so glad I found you. Besides today our kids have 1 week of school left before break. 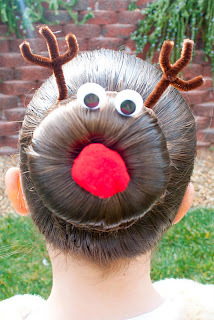 I told my daughter I will do her hair a different Christmas theme every day until they are out of school. She is so excited. I couldn't do it without inspiration from you. Thank you. Merry Christmas! Q for ya! This nice post found it self all the way to Sweden! My 8-year old will have this tomorrow on our Chrstmas Eve! Will be a blast! from a salon is not painful at all. And thus, you will not be hurt even a bit, when you have the hair extension. Laura, You have my permission to post anything you like. :) Thank you for contacting me! It is probably a little red fluffy craft bobble or pompom if you prefer. You can buy them from any craft shop. Hope that helps. Cute, i should try it on my niece. Thank you. I need to show this to my daughter. I think she'll have fun doing this for her ballet classes this week. Sooooo cute, hope I can do this for my daughter's!! Hahaha! This is very cute! This would look best on little girls with long hair! 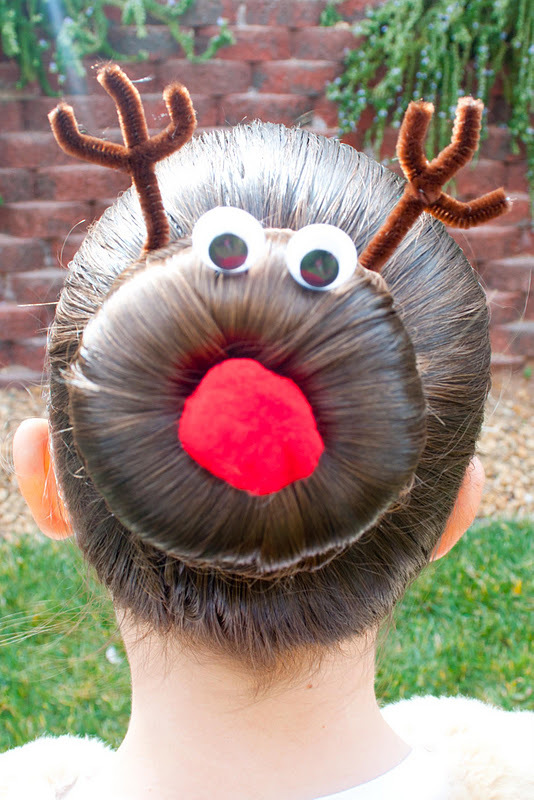 I love how you were able to incorporate the holiday feel to your creative hairstyle. And you didn’t spend a lot on it too! Kudos! I'm going to use this in my sons' hair for Christmas because of a bet they made with their sister. It looks really cute thanks for posting this tutorial. 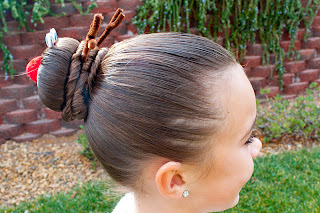 Really valuable blog and the best idea to Holiday Hairstyles, i will try it. What kind of glue did you use? I'm thinking hot glue. Hello! I write a blog for a children's salon chain in the UK, and I would love to feature your image and description for a Christmas hair article. May I have your permission to share it please?